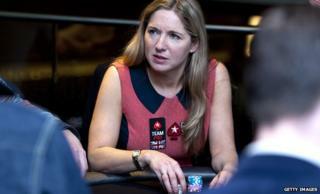 Journalist and broadcaster Victoria Coren Mitchell made poker history on Sunday by becoming the first two-time winner of the European Poker Tour. She beat 556 competitors to win a cash prize of £391,932 and a watch worth more than £4,000 in Sanremo, Italy. Her victory came after a finale, in which she fought back from eighth place in the Tour, a week-long international tournament. Coren Mitchell, who presents BBC Four's quiz show Only Connect, won in 2006. I've long since lost the sense of what my day job is. Am I a professional writer who plays poker as a hobby? Or a professional poker player who writes as a hobby? In doing so, she became the tournament's first female winner. Her second victory brings her lifetime winnings to £1.5m, putting her in the all-time top 10 female earners at the poker table. "I WON! I bloody WON!!!!!!" she wrote on Twitter after defeating Italian player Giacomo Fundaro. "Sorry for that language on Easter Sunday. But I WON!!!!!! That is at least partly thanks to the amazing support, God bless everyone." "People in poker know it's about showing a profit," Coren Mitchell said as she accepted her trophy. "The minute I won 8,000 euros (£6,576) it was a good trip. But tens of thousands of people (on Twitter) got behind me. I thought I'd be happy with sixth, but also thought they'd be disappointed." She added: "I kept calling my husband during the breaks asking, 'Is sixth place all right? Fifth place?'" Her husband, comedian David Mitchell, added from the side of the stage: "I thought perhaps I should have been saying, 'You must be first!' Not, 'Eighth seems great.'" A member of the elite Team PokerStars Pro, Coren Mitchell is the daughter of broadcaster Alan Coren. She writes weekly columns for the Guardian and Observer newspapers, and is a regular panellist on shows like Have I Got News For You and Question Time. Following her victory, a post on the Poker Stars website quoted Coren Mitchell as saying: "I've long since lost the sense of what my day job is. "Am I a professional writer who plays poker as a hobby? Or a professional poker player who writes as a hobby?"